I am the most effective in the classroom when I remember to always be alert, to be ready to adapt and shift on a moment’s notice. Sometimes the plans work and the goals are smoothly met. The students tackle each task and grasp the new concepts and skills. Then there are those other days, the ones where it should be working, it worked before, but it just isn’t now. Those are the times when we have to punt, to simply throw the old plan out the window and modify the lesson to meet the kids. 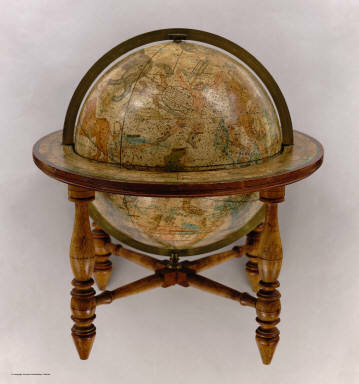 Yesterday I gave a pop quiz on maps and globes. It was material that we had worked on for three days. I had showed a variety of maps and compared them to globes. We acted out the globe and different map projections. For being a globe, the students stood and with their arms over their heads, curved forward. For the Mercator map, they stood straight with their arms spread wide, to show the lines of longitude that run straight from top to bottom of the map. Their mouths were wide open to indicate how large Greenland is on the map, in comparison to its size on the globe. Their favorite was to come up with a way to show an interrupted projection, which had them standing like storks or Egyptian Pyramid-style dancers. They had then copied notes from the board, while we had a conversation about the advantages and disadvantages of each one. Their homework had been to type up the notes on their new laptops, to help them see if that helped them learn the information. The next day in class, they all said that the combination of handwriting and then typing made them feel like they knew the information. Their homework had been to study their notes. It felt like a varied approach, and the class had been engaged and interested in how cartographers impact the maps that they make. The next day, I wanted to see how much they had retained of the information, so I started class with a quick quiz. I expected that it would be an experience of success for them. For the first section, early in the morning, the students reacted with confidence, reading over the worksheet and quickly filling in the worksheet, especially the one where a penguin looks at an upside-down globe and smiles. My second section came in after lunch. They took one look at the worksheet and became deflated. Some began writing, but many of them picked up their pens and simply stared into space after writing their names. Some began to become visibly disturbed. After a few minutes, I realized that this was not accomplishing anything that I wanted. I had no desire to make them feel like they didn’t understand the material. I stopped the quiz and quickly changed the homework. It became to study the quiz that they had in their hands and to be ready to take it again the next day. I told them that I would collect both quizzes, so that those who had been doing really well could be able to show me that, but that those who were finding it too difficult would have time to review the material. The next morning, when they came in, it was a totally different feel. They were ready and eager to show what they knew. Sometimes how a lesson goes isn’t about teaching strategies or planning. Sometimes it is simply about the kids. Where are they at that moment? What has happened in their day? They are each unique individuals who form unique and ever-mutating groups. No two classes are ever alike. It may be my job to cover certain skills, but to be effective, I have to stay attuned to how each group tackles the work and adapt on an almost moment-to-moment basis. And the final lesson, after lunch should never be the time to give a quiz. The brain has a hard time thinking when the stomach has top priority. One of the amazing aspects of the digital world is how visible we all are, in so many ways, whether we want to be or not. If we want to participate in the global community, using it as a place to learn and grow, we have to be willing to be seen and known, to leave a digital footprint. The community of educators online is a growing and active community, and with every update that we post, every email we send, every mention that is posted about us, we are connected and made visible in the larger world. We leave our tracks behind us for others to follow. In a village, it has always been through knowing each other and using the strengths that each can offer, that the village has been able to provide for its members. It is through this personal knowledge and connection. The goal of a village has always been to survive, to weather the challenges with which it is presented, from drought to famine to war and to draw together to overcome each one. Each person in a village, who has been known from birth, must be taught the skills necessary to aid the group. The role of an individual is not to achieve personal success, but instead it is to contribute every possible talent and skill to help in the village’s survival. As each member works together, the village as a whole is viable. We are now part of a global village, creating digital footprints that identify who we are and what we can contribute to solving the challenges of our day. In the village of education, there are countless problems that face us. No matter where we are teaching, big or small school, public or independent, the world is changing too quickly for each individual teacher to stay ahead and master all that is necessary to give our students the best education. We must draw together, allow ourselves to be known and to learn from each other. There is amazing wisdom and energy in the global world of educators. As we take the time to become a part of that community, we can begin to find solutions to the challenges that we face. We can begin to understand that we are not alone. We need to listen carefully to the voices of wisdom among us, to gain from their experience and insight. As we read each other’s blogs and follow each other on Twitter, we can identify those leaders who can help move us forward. If you have someone that you know of who has enriched your learning and added to your understanding of how to be a better teacher, please share that. Together we can develop a global village that can successfully take on the challenges it faces! I just listened to a interview with John Seely Brown and John Hagel on their new book, The Power of Pull, that got me thinking about imagination. One of the points that they made was that today’s students need to be able to imagine, that in an ever-changing world, they must be able to think beyond the world that they have now and imagine a different one. It is almost like going back to their early years of creating fantasy realms, where anything was possible. They need to move beyond what is and picture what could be. This is such a challenge for teachers who were trained under a system that, in Brown and Hagel’s terms, “pushed” the given curriculum to the students whose job it was to receive and master it. What was necessary and even critical for success was known. It had been proven to work over previous decades and therefore should be passed along to the next generation. Much as hunter-gatherers trained their children to know the edible and inedible plants and the migration routes of critical herds, today’s teachers were trained in the vocabulary and knowledge of the 20th century, given the tools to succeed on SAT’s and MCAT’s, so that we could make our way in the world. While there is definitely still a need for many of those skills, the reason for teaching them has shifted. It is no longer the case that simply following a given track, provided by a teacher, will necessarily lead to success. The goal posts are now moving, moving in ways that we not always apparent in the days and months ahead of time. What was relevant, even critical, for past generations may no longer be pertinent at all. Teachers now must not only teach their content area, but also begin to identify what has lastly value. This is a tremendous shift, one for which most of us were never trained. One of the keys is to unlock our own imaginations, to remember what it was like to dream, to have no holds placed on what could be. As we allow ourselves to become learners again, to return to a place where we are not in control and there is not limit to the horizon, we may be able to guide our students in their own explorations. We must combine all of the wisdom that we have gained through our own experiences and learning with a renewed sense of wonder, so that we can direct and enhance the learning of our students. As a middle school teacher, I want my students to dream their own dreams as well as be exposed to the dreams of others. I do not want them limited to the horizons of a teenager. As teachers, we need to constantly be broadening their exposure to new ways of thinking. While middle school passions may turn into lifetime ones, they may not, so we must help them continually access their own imaginations and share the imaginations of others with them. We need to not simply be “pushing” facts at them, but also be sharing and imagining together. Then, together, we can dream big dreams.